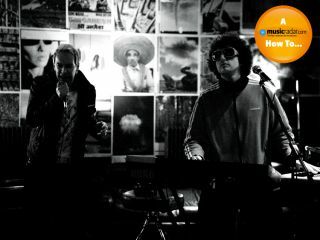 Kids On Bridges are an electro-pop duo based in Manchester and Liverpool. The band members - Christian Bragg and Daniel Rankin - secured management and landed a record deal in Japan, where their debut single, Popstar, made the dance chart Top Ten in 2009. MacBooks play an essential role in creating their music and in their live shows. As well as keeping their own live schedule, they have supported new-wave legend Gary Numan, pop starlet Little Boots, Tinchy Stryder and Miike Snow. They have just signed a deal with the Wall of Sound label in the UK. How and when did Kids On Bridges first get together? DR: "We got together about 16 months ago after meeting at Alien Sound Recording Studio, where we were both working on different projects. We got along amazingly well and decided to give it a try. "We started working with Mark Wainwright, a producer at Alien Sound, and the project took shape really quickly." What specific role does each member play in the outfit? DR: "Chris is more the raw ideas guy, particularly lyrically. I'm more the gluing-it-all-together-with-music guy. Live, we both do a bit of everything, but Chris sings - he has some crazy little gadgets for messing with his voice - and I play keys and guitar. "We are both constantly writing tracks and doing everything we can think of online and locally press-wise, to push the band." How have you been influenced by technology in developing your sound? CB: "When we first came up with the ideas, most were just a scratch track in the mobile phone! Then we moved to Danny's Mac, and then to Logic in the studio." DR: "The live setup is run on a MacBook. We have a projector and screen with videos for the live show - the videos were all created on the MacBook too. "I even use my iPhone to promote the band: I've loaded up the album, pictures, videos… it's all on there!" Is it difficult to find a good manager? How did you do it? CB: "Finding a good manager who understands your music is quite hard. We had met a few people along the way - just friends who were willing to help out. Luckily, we managed to find Danny and Justin from Modern Artist Management, who both really understood what we were trying to do with the music. "Danny heard about the band on a trip to Liverpool and contacted us through MySpace. We had a meeting, and things moved forward quite quickly from there. Having management with drive is important." How did you get the attention of the record labels? What methods would you recommend for up-and-coming bands? CB: "Hard work! There really is no right or wrong way, other than doing everything you possibly can to get your music out there - sending it to press, DJs, social sites, letting as many people hear it as you can. "We spent a lot of time making sure we had all our songs recorded as close to perfect as possible, and we had a good idea of where we wanted to take our music in the future." DR: "Wall Of Sound saw our 'Anti X Factor' video on YouTube and invited us to do their anniversary gig. Mark Jones, who is head of the label, loved what he saw, and for us it's the perfect musical marriage to be on a label that understands what we're all about." What can a label do for you that you can't do on your own? CB: "It's about giving you a platform to present your music. Without a platform or team around you, it's hard to take things to the next level." CB: "Our first break came supporting Gary Numan. Through MySpace, someone involved in the show picked us up and decided it'd be a great support slot, and it turned out to be exactly that. "It was a wicked gig, and he's a really nice guy too. We're hoping we might get back out with him next year. That was our first gig, but it was quickly followed by gigs with Little Boots and Miike Snow; then we landed a deal in Japan!" DR: "Japan was incredible; we had such an amazing time. We did TV and radio over there to push the fact that we were gigging, and people flocked to see us. We can't wait to go back." What gear do you use on stage? DR: "Everything is basically controlled from the laptop. Because we have live visuals, we have to make sure they're synced up with the tracks. We use two Korg MS2000s - well, one's an MS2000B - a K-Station synth, a Fender Telecaster and lots of little gadgets, depending on how big the setup is. "Everything's backed up on a hard drive, just in case. It's a good job, too - I had to wipe my laptop recently because the hard drive was damaged! We're still building the live set. It's very difficult, with just the two of us, to carry loads of gear around, but we're looking to expand. It means we get to go shopping for new toys!" Have you had any computer-related nightmares onstage? DR: "Er, yeah. Unfortunately, one of the old damaged videos turned up in the set the other night, which wasn't amusing - it started going crazy, stuttering and blacking out! "Also, our technician forgot to plug in the laptop once and I'd been watchingFamily Guyvideos on the way to the gig, so the battery was dying and it just cut out! We got a little lucky though - it stopped right in the middle of a break in a song." What's your best advice for an aspiring band trying to make it in 2010? CB: "Believe in what you are doing and do it for the right reasons. You have to love music. Oh, and find a good management team and agent!" Dream of a career in a pop band? Get the brand-new Computer Music Special: How To Make It In Music, out now, to find out how to make it a reality.